Detailed design of Seville-Huelva high speed railway line - Section 2: Valencina de la Concepción – Sanlúcar La Mayor (Seville). Platform. Construction of a double-track line, with standard gauge, 14 m wide, with a track-to-track distance of 4.70 m, including the track bed and ballast sub-base. It is noteworthy to mention the Viaduct over River Guadiamar, 1,050 m long. Five more viaducts are planned to be built, together with 13 overpasses and 7 underpasses to ensure the continuity of the roads affected by the high speed line. The project also includes the construction of 35 transverse drainage structures and 3 canalization works, as well as a Train Overtaking and Parking Post. The design speed of the project is 350 km/h. Both terminus host passing tracks with a functional length of 400 m and shunting necks with a total length of 150 m. The line plan will be completed with two crossovers between the main tracks at the exit and entrance of the Train Overtaking and Parking Post, suitable for speeds of 350/220 km/h. 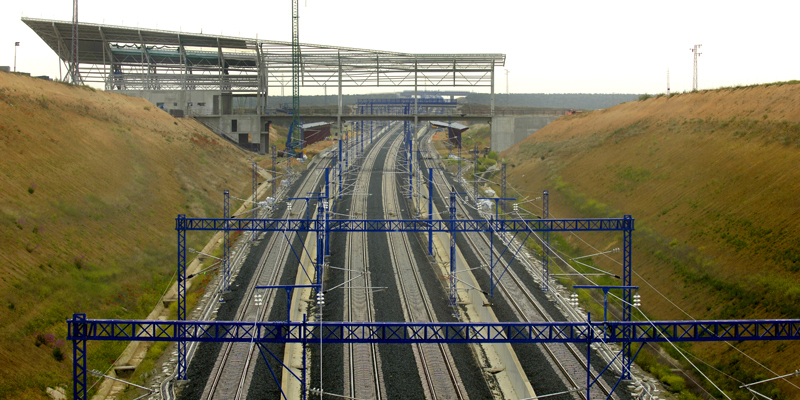 The project also includes: corrective measures to guarantee the environmental integration of the works, arrangement of the cable conduit and crossovers for future railway facilities, relocation of the affected utilities as well as all actions required to solve temporary situations during the construction works and closing of the railway line.